John Makowiec receives a scholarship for sharing the same innovative spirit as former CEO and President, Richard P. McWilliam. CARLSBAD, Ca. (June 12, 2014) – John Makowiec is a Chicago-area teenager whose passion for collecting sports cards began when he was just five years old. As a high school sophomore, John created ‘Cards2Kids’, a charity organization that collects new and used sports cards to donate to various child-focused associations and hospitals. As an avid collector, John wanted other kids – especially those who are ill or may not have the means – to experience the joy of collecting sports cards and holding your favorite player in the palm of your hand. John started out by setting up at various events and asking collectors to help fill donation bins. He then recruited a number of hobby shops and appointed local ambassadors to help the cause, gradually building a team of volunteers to help repackage and ship the cards. Over the last 3 years, over 1,000,000 cards have been received by kids across the country, thanks to John and his team. Now a High School graduate preparing for his freshman year at Duke University, John plans to continue what he started - with a little help from Upper Deck. At a special ceremony last night, Upper Deck announced that John has been awarded a scholarship in recognition of his innovation and leadership in creating and managing the ‘Cards2Kids’ organization. The scholarship is in honor of Richard P. McWilliam, Upper Deck’s late founder and CEO whose innovation, imagination and enthusiasm revolutionized the trading card industry when he started the company back in 1989. Upper Deck surprised John Makowiec at the Bleachers Sports store in Winnetka, Illinois yesterday with the announcement of this special scholarship award. 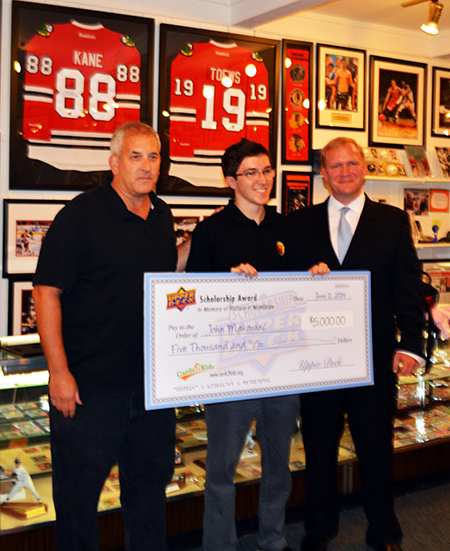 Upper Deck staff proudly presented a giant check to John in front of his family and dozens of supportive collectors to commemorate the occasion. Cards2Kids was founded by John Makowiec, a Chicago-area teenager whose passion for collecting sports cards began when he was just five years old. Over ten years later, as a high-school sophomore, John created Cards2Kids – a charitable organization* that collects new and used sports cards and donates them to kids in need through national and regional charities such as the Boys & Girls Clubs of Chicago and Children’s Memorial Hospital. After partnering with organizations such as the Chicago Cubs and Upper Deck and working with local card shops to collect donations, Cards2Kids has collected over one million sports card and is still counting. With over 20 years of experience, Bleachers has accumulated one of the most extensive collections of modern and vintage sports cards in the world. In addition, Bleachers offers a full line of authentic memorabilia and is a premier source of Rock N' Roll and Music Memorabilia.